Ghouls'n Ghosts (대마계촌) - Cheats - SMS Power! 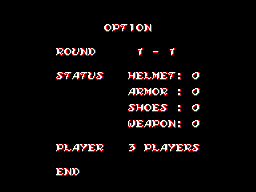 On the title screen, press to go to an options screen offering a level select, item selection, and the option to have infinite lives or invincibility. Use to decrement and to increment.